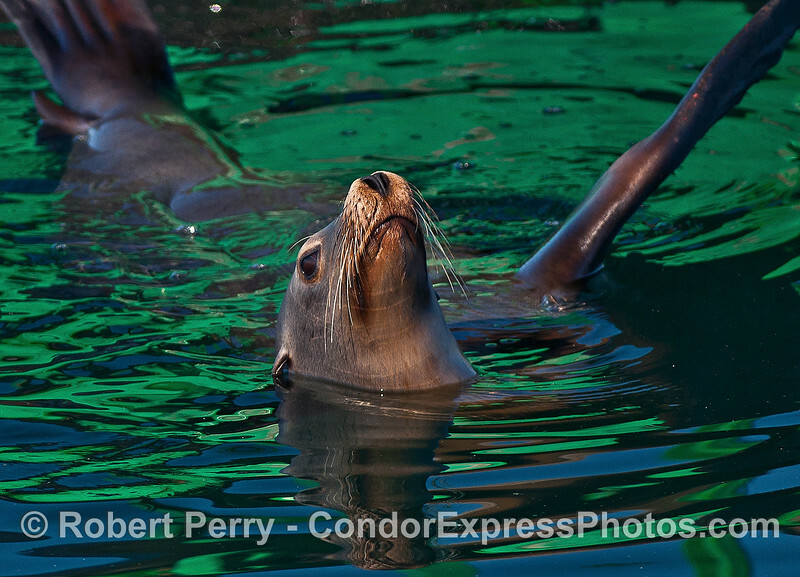 Dave throttled up and we reached the back side of Hogan around 935 am, and after a brief overview of offshore platforms by Dave, he continued to chive onward to the east where the staff photographer had spotted the first tall spouts of the trip. 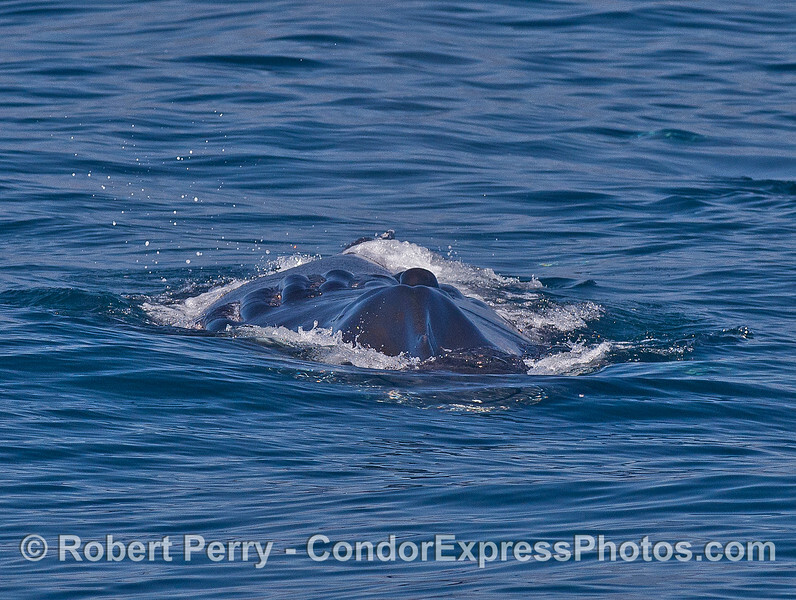 We ended up off of the Rincon with 3 humpback whales. 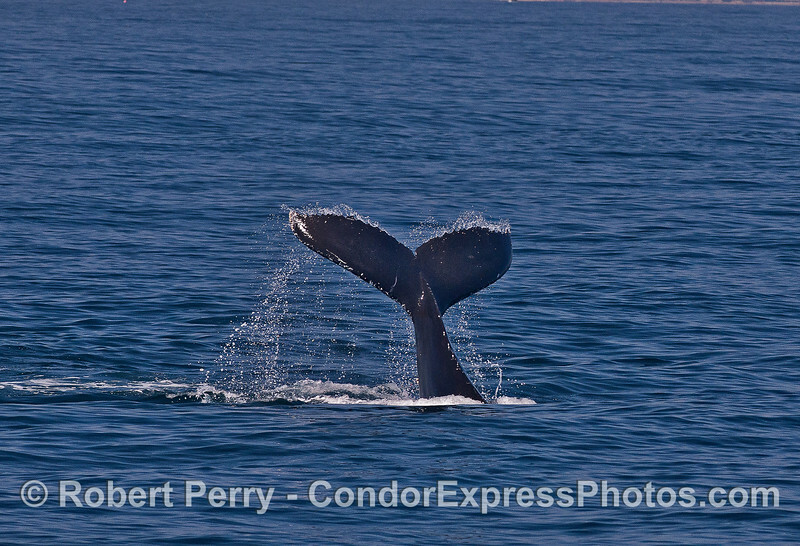 One made a very friendly approach and the on-board whale watchers were starting to get the hang of things. We watched for quite a while and kept seeing additional spouts all around and everywhere we looked. 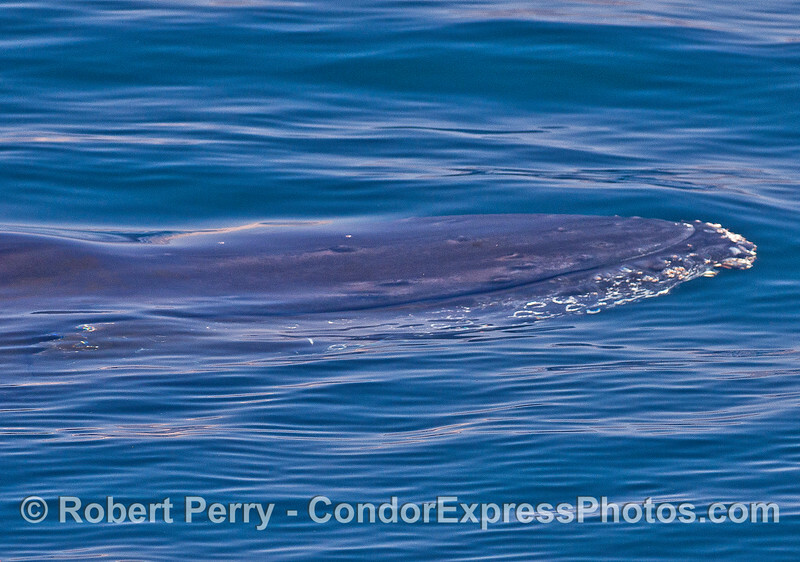 At 1025 am we sighted two Minke whales that surface very close to the Condor Express...great sightings. 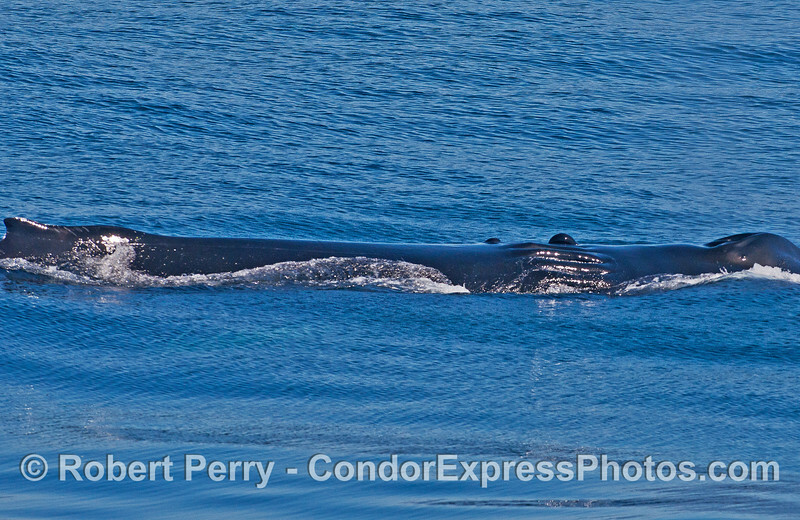 At 1055 am another humpback whale surfaced and it was our friend Scarlet. 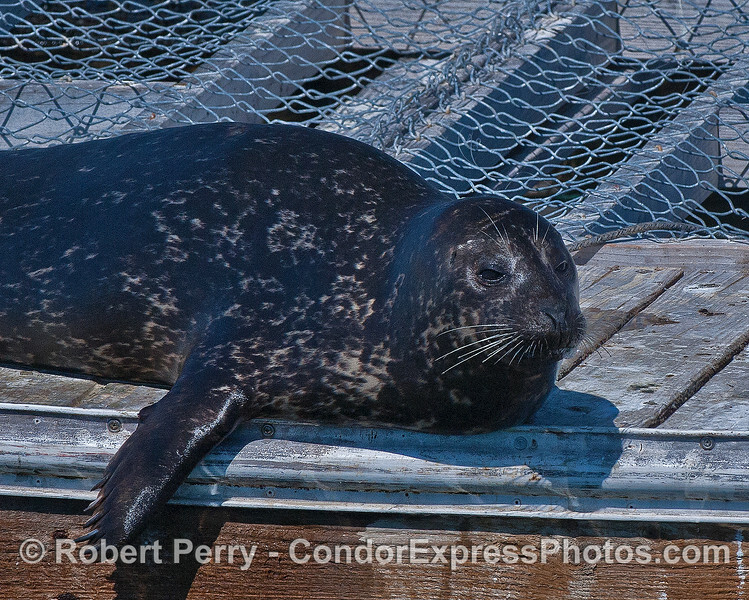 We had great looks at Scarlet and she is always friendly. I confess that Scarlet was lookin' pretty good on that deep blue glassy water today. 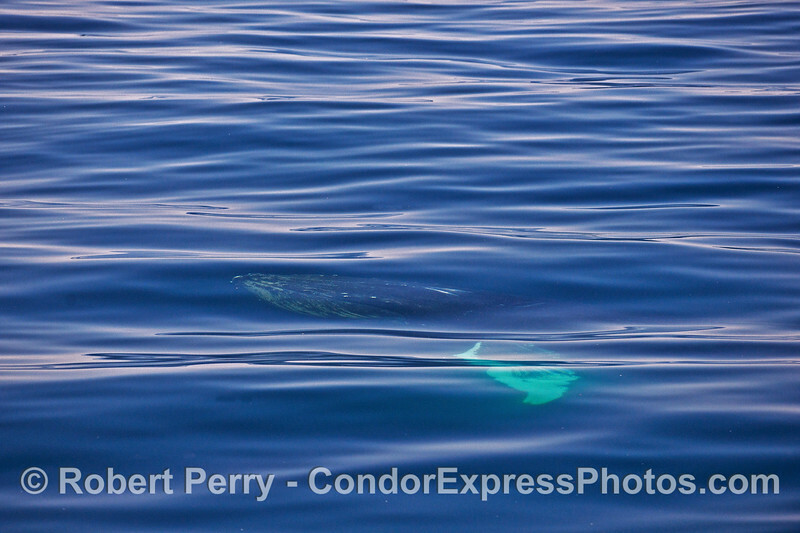 Three minutes later we came upon 4 additional humpback whales (making a total of 9 for this trip)...the white pectoral flukes of the lead whale glowed blue under the crystal water. 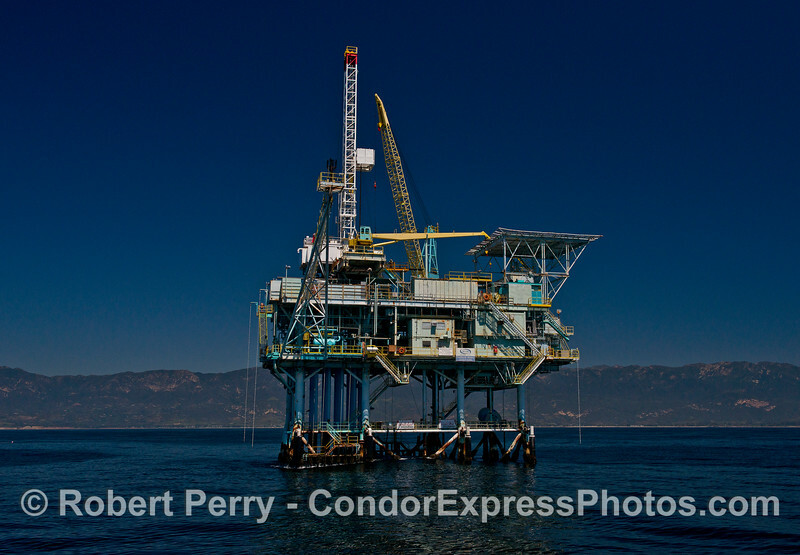 By 1107 am we were on our way back to Santa Barbara as we passed close to Houchin. Three minutes later Dave veered off course to not mess up the fine day a large ocean sunfish (Mola mola) was having on the surface. 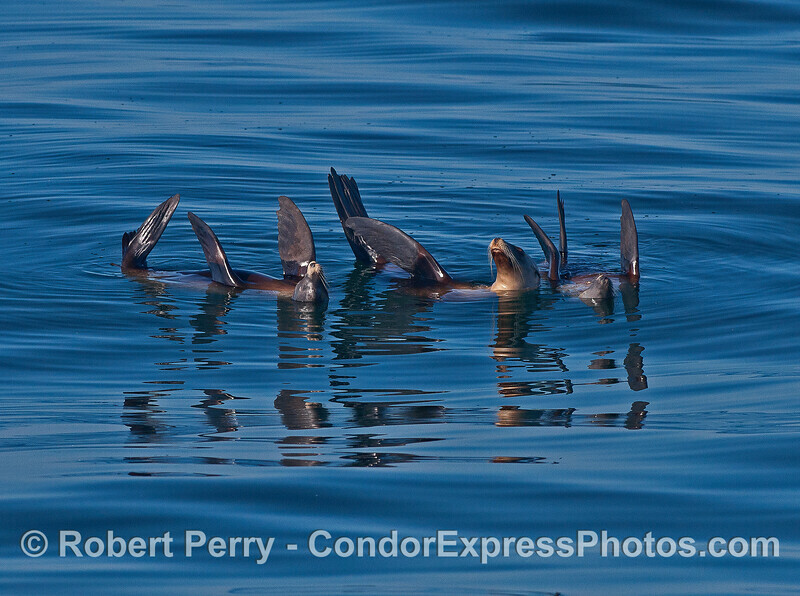 It looked like the same individual we sighted yesterday. 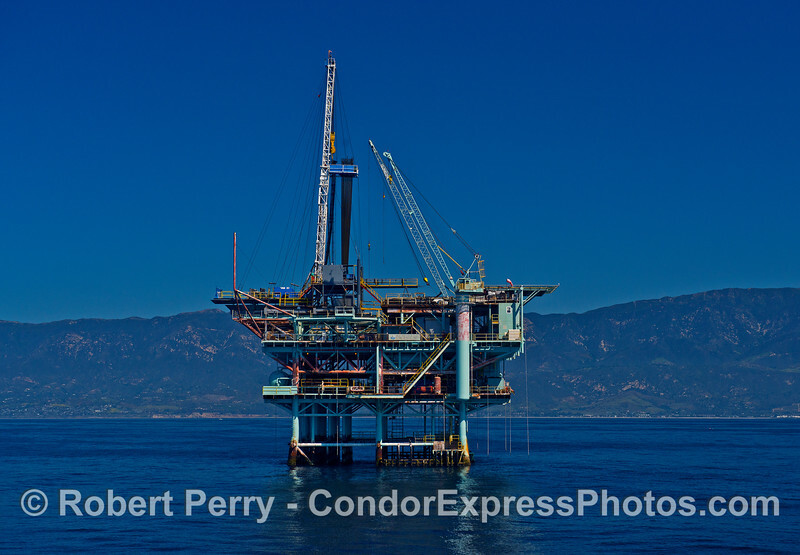 Once again we returned to the scene of all that humpback whale action, and by 1245 pm Dave had stopped to deliver his now famous monologue on the offshore platforms as we all got good looks at one of the smallest rigs, Henry. 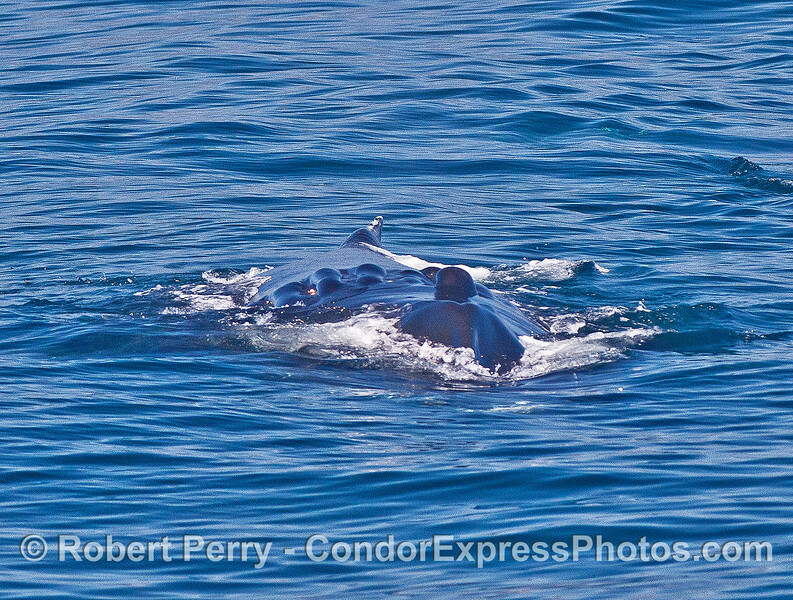 As we pulled away from Henry we had our first of 7 humpback whales for this trip. 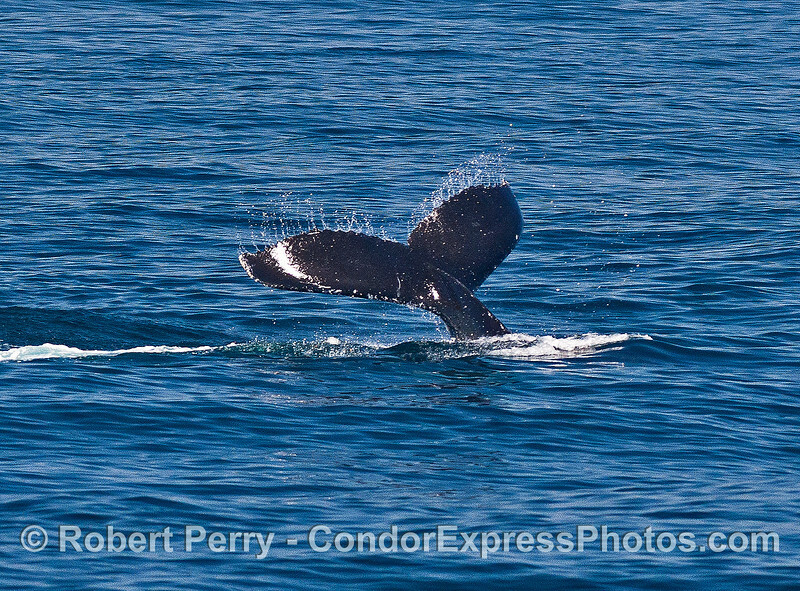 Not long after we had a sighting of 4 more humpback whales, one of which was Scarlet again. 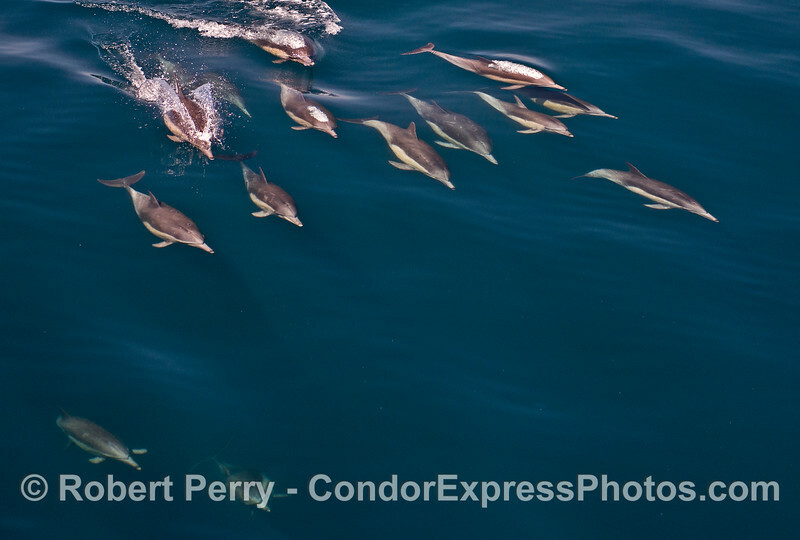 As we drifted along watching humpback whale spouts all around the boat, a mega-pod of at least 500 long-beaked common dolphins began to drift along with us. This was siesta time, in my opinion. 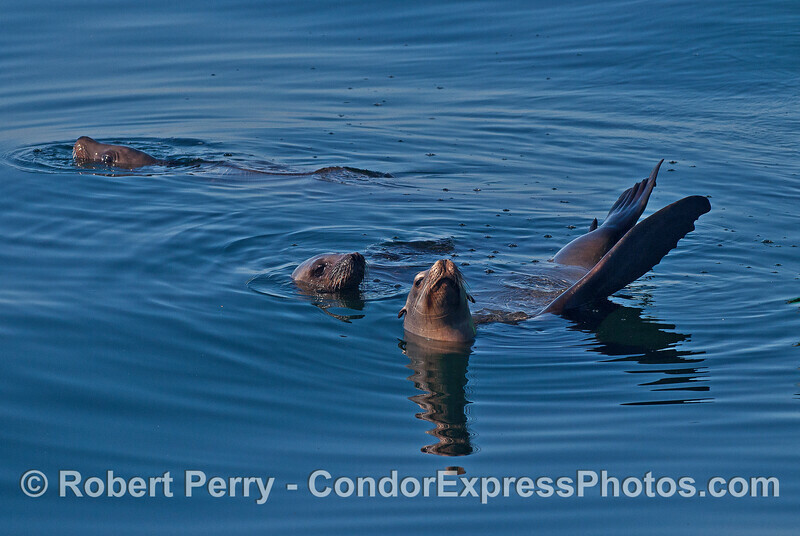 Dolphins milled around, some of the males pestered some females, speeds were slow and direction of travel was random. 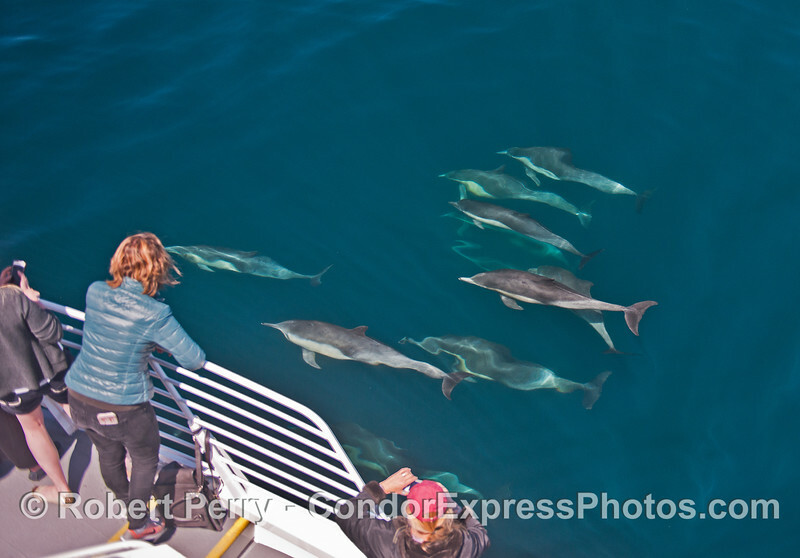 As they intersected the boat, they took a leisurely look at the humans with cameras and cell phones taking dolphin-selfies. 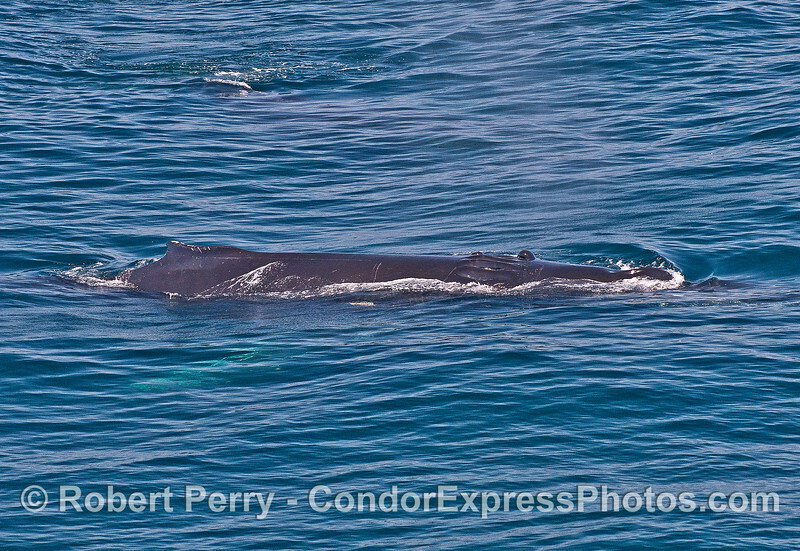 The last major sighting of the day was of a pair of large humpback whales, close to Hogan, one of which was throwing its tail and making a big fuss. 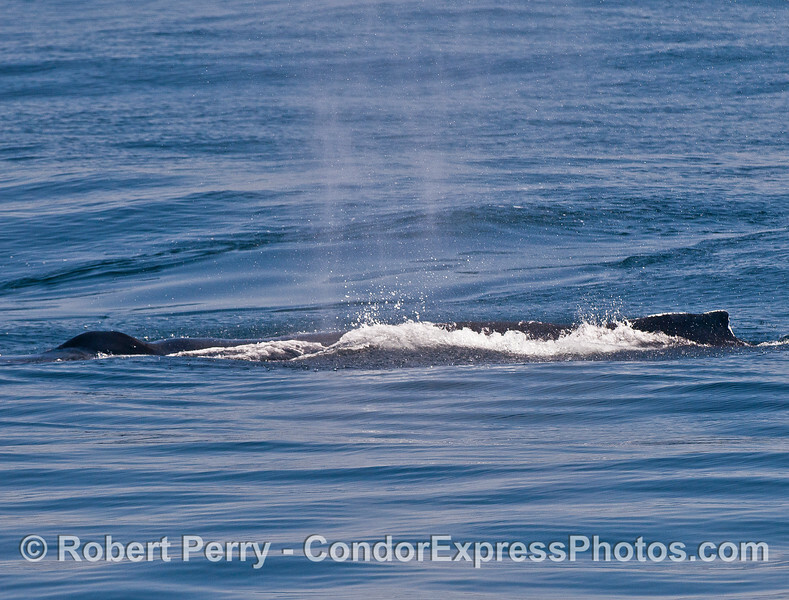 It was a major contrast to the sleepy tone of the afternoon with all the other dolphins and whales. 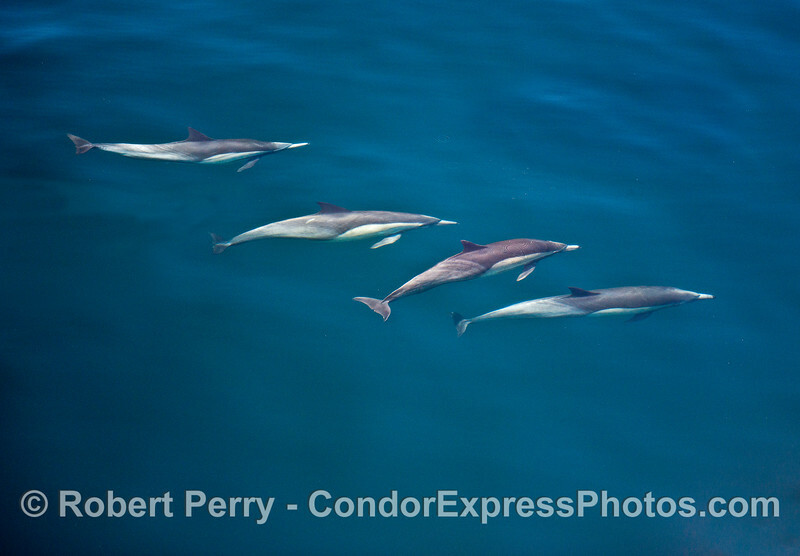 Long-beaked common dolphins - underwater view. 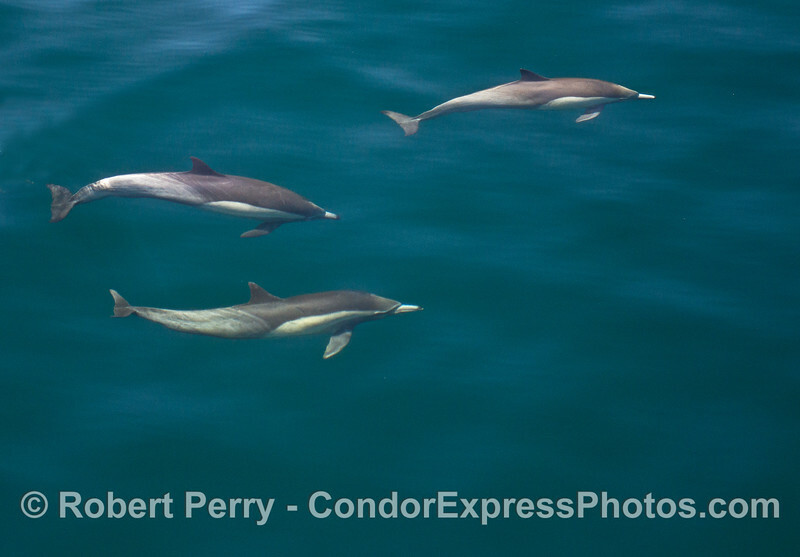 Long-beaked common dolphins - group on a large open ocean wave. 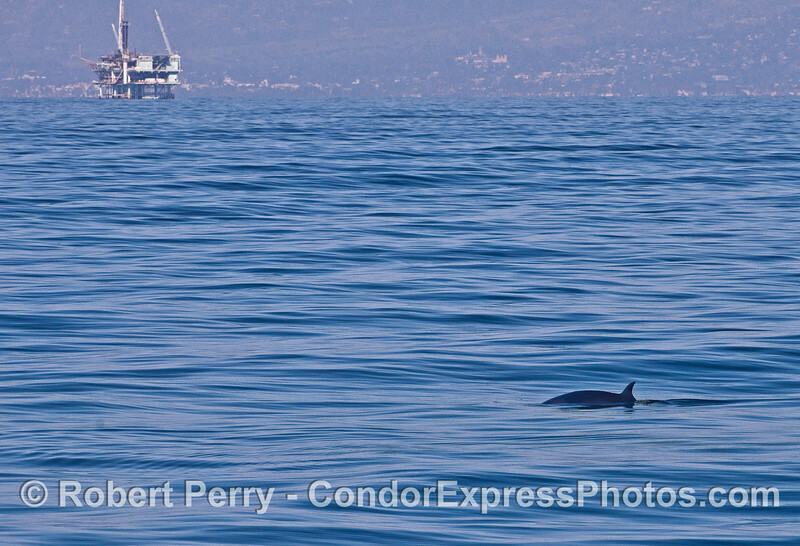 Long-beaked common dolphins - and passengers. 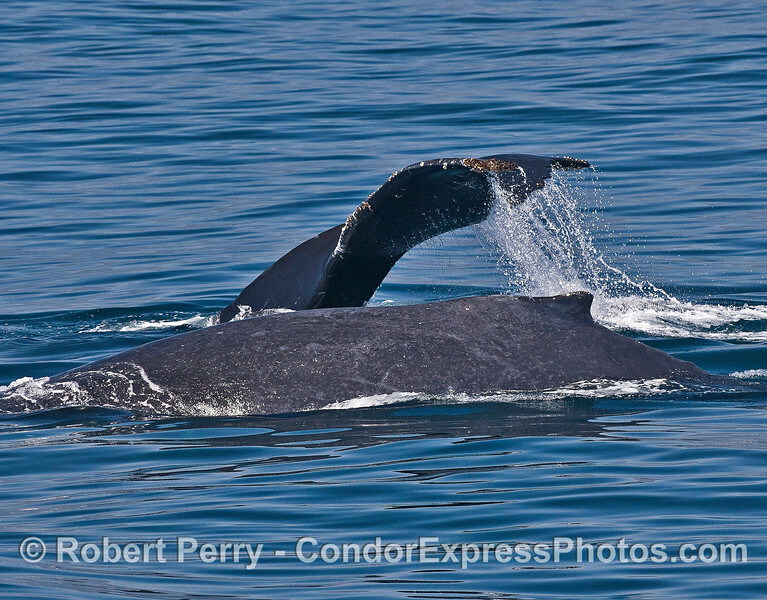 Humpback whale glides along just under the surface and peaking through the waves. 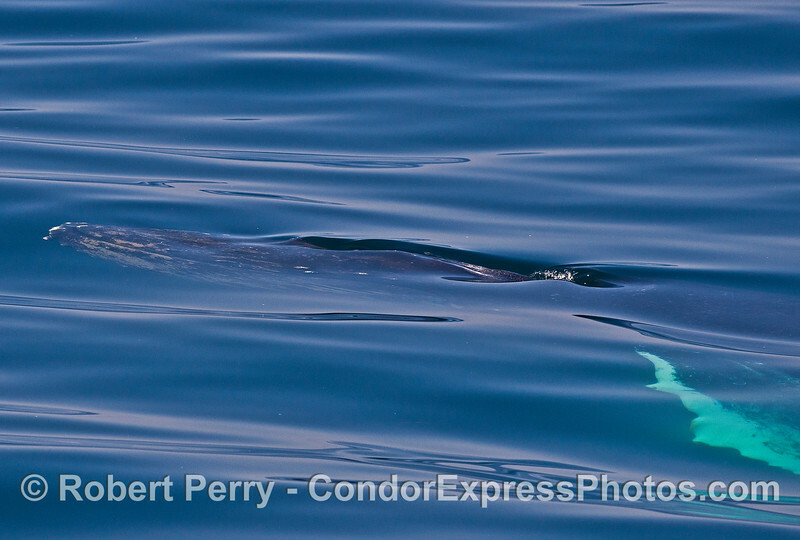 Humpback whale glides along just under the surface. 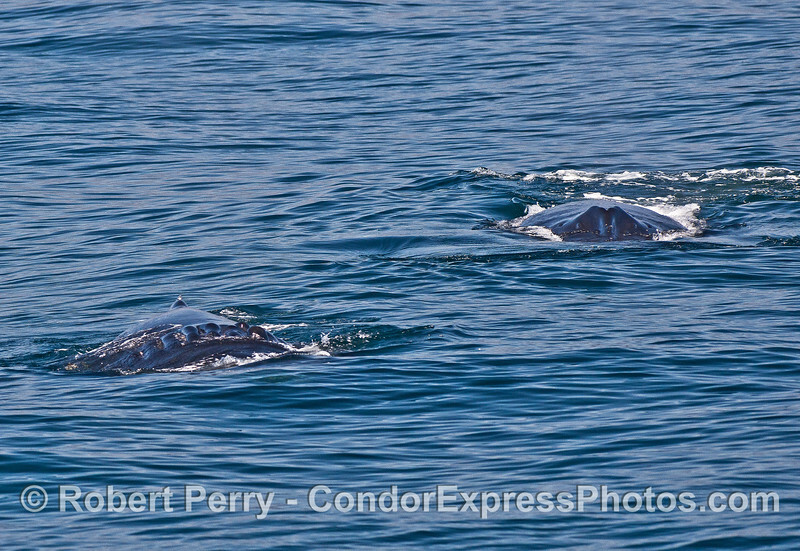 Humpback whales - two close together. Scarlet shows her scars. 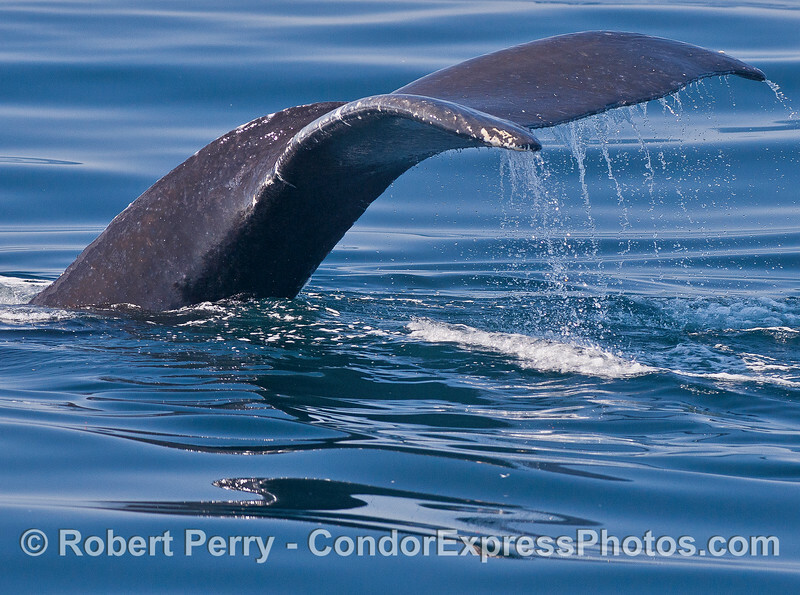 Note the globular masses behind her blowhole in this head-first image. 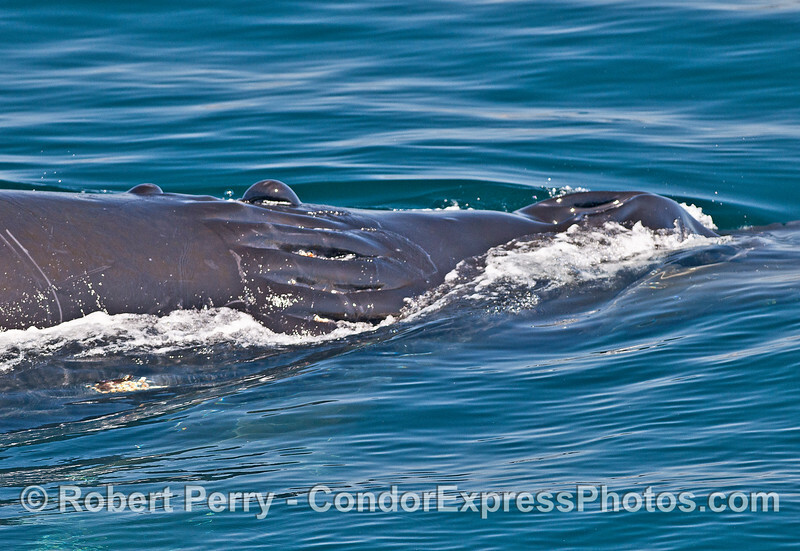 Globular masses behind the head and blowholes of this humpback whale, caused by a propeller and ship-strike, identify her as our friend "Scarlet." 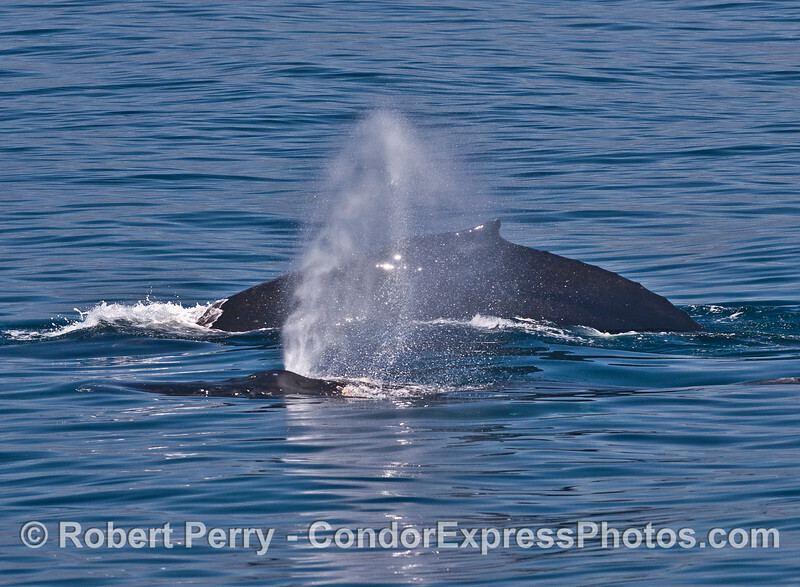 Humpback with mirror spout spray. Scarlet shows her scars. 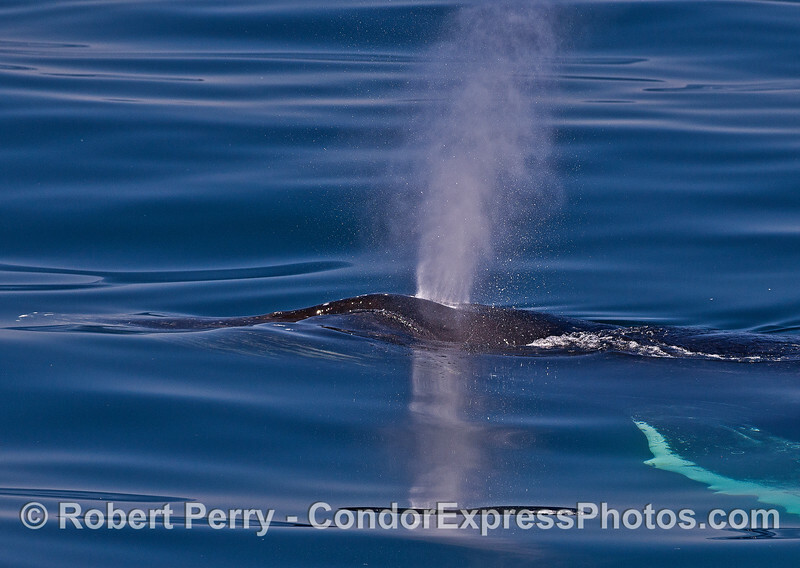 Note the globular masses and propeller scars behind her blowhole. A close look at the propeller scars and globular masses that gave Scarlet her name. 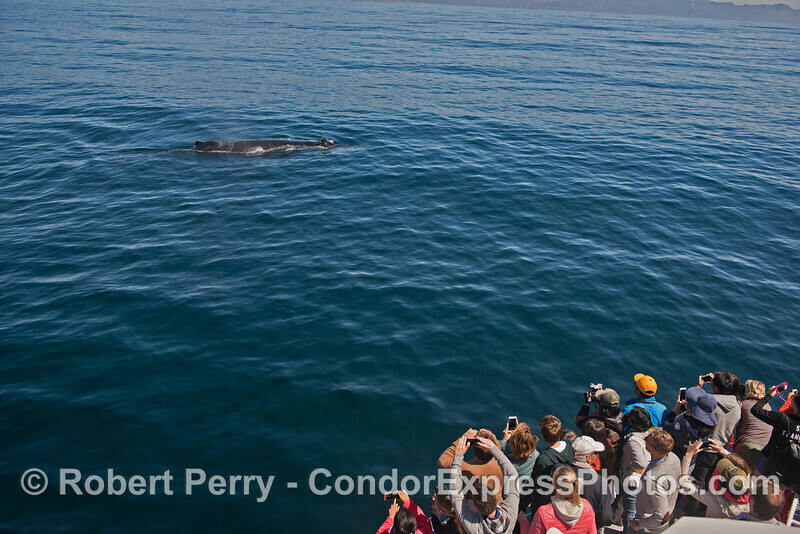 Humpback whale and fan club. 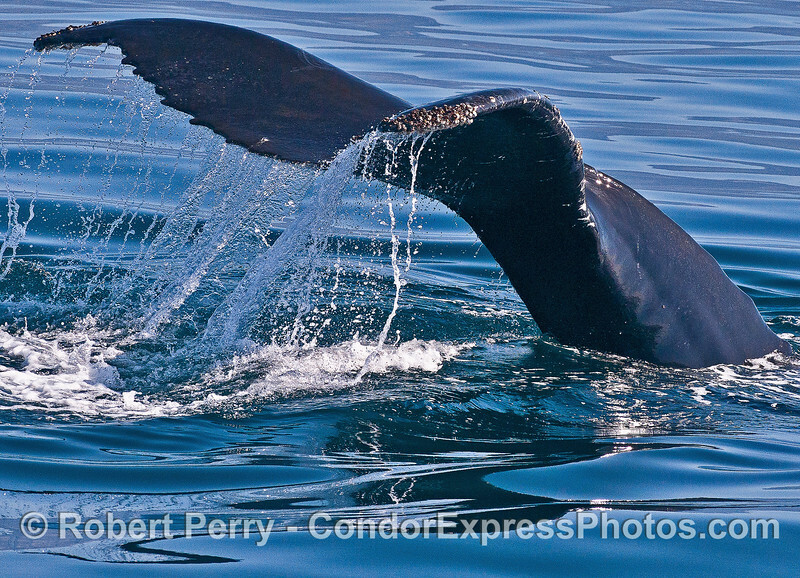 Humpback whale submerged and using passing waves as a window to look out. 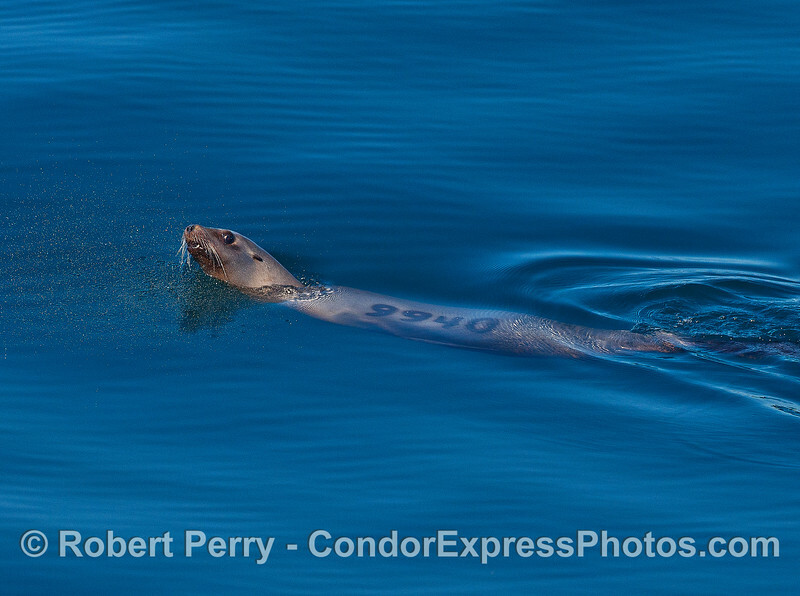 Branded California sea lion #9940 from San Miguel Island survey. Map showing major sightings on today's adventure.